Young Serafina lives on the Biltmore Estate with her father. They live illegally in the basement so Serafina stays hidden, coming out at night to catch rats, which she does extremely well. But because of this, Serafina has no friends and doesn’t experience much that a normal pre-teen might get to experience. She does, however, see some things that she shouldn’t see. When some children from the estate go missing, Serafina is certain she knows who is behind it … the man in the black cloak who has been walking in the halls of the estate at night. Serafina reveals herself to young Braeden Vanderbilt, the nephew of the Biltmore’s owners, who finds that he enjoys Serafina’s company, and as child of wealth (and protection) has also not had a normal upbringing. When concerns over the missing children strike close to home and Braeden promises that he’ll see to it that a thorough search is done to find the children, Serafina takes it upon herself to confront and contain the man in the black cloak. She has to defy her own father, something she’s never done, to do so. I was really taken with the characters here, who are presented in such a real fashion. Everything about the writing brings the reader right in. It’s a great feeling, as a reader, to be so involved in a story and so connected with the characters. Young readers are bound to find themselves involved with this story. The mystery of who the man in the black cloak really is and what he wants is very strong. For 250 pages I was really interested in what was going on. But the book is almost 300 pages long. The ending of this book wraps things up very quickly, much too neatly, and tosses out some unexpected bits that changes the nature of the book. From a page-turning mystery/adventure this book suddenly becomes a fantasy, with magic explaining things away where there really wasn’t any earlier in the book. It felt like a completely different story as we got to the end. The climax really came out of the blue for me. The denouement brought it back on track, and I really appreciated it and it does leave the door open for sequels. I liked so much of this book. I even liked the climax to the story, except that it didn’t feel like the same story. I’d like to read further adventures of Serafina – I suspect there’s more in the cards for Braeden – but I’m hoping it ties together better. Looking for a good book? 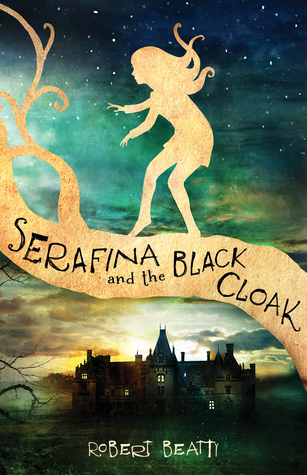 Serafina and the Black Cloak is a thrilling mystery with a fantasy ending that should have young readers fully engaged, but possibly a bit a confused. I read the second book in Mira Grant’s “Newsflesh” series a few years ago when it was in the voter’s packets for the Hugo award. I had liked it enough that I wanted to experience the whole series. I selected the series through my Audible subscription and made this my commute listening material. I really enjoyed it! While the series features zombies as the horrific obstacles, like most stories worth reading, this is a story about people overcoming those obstacles. In Feed, the humans we follow are brother and sister team Georgia and Shaun Mason who are popular bloggers in a world that is trying to survive the zombie apocalypse. The zombie outbreak occurred 20 years prior … a virus (Kellis-Amberlee) that takes over the victim’s body and gives it one direction: feed. This isn’t the plot … this is the setting, the world that Mira Grant has created. And so, when U.S. Presidential candidate Senator Ryman invites the Masons to be on the campaign trail, it is unusual (showing Ryman’s progressive attitudes) and it is a chance for the Masons to get a serious position in the blogging field. What could go wrong? Did I mention that there are zombies? What if someone were to use the Kellis-Amberlee virus to put an end to Senator Ryman’s campaign? Or to go after those following the campaign? And would anyone possibly believe a pair of young bloggers if they uncovered such evidence? This book is an absolute marvel in story-telling. The world-building is believable (even if it does contain zombies) and the characters are fresh and real and it is easy to get attached to all of them. The plot, as a political thriller in the future, is full of action and excitement with more than just a little death and destruction. The Audible edition is narrated by two readers: Paula Christensen and Jesse Bernstein. They both do a really great job of creating characters and letting the listener really feel the story (sadly, this is not always the case with Audible books). Not being a big zombie person myself (though I have watched the first two seasons of The Walking Dead) I was surprised at how much I enjoyed this, but I think it’s because it’s not about zombies, but instead is a political/medical thriller involving progressive journalist/bloggers. Looking for a good book? 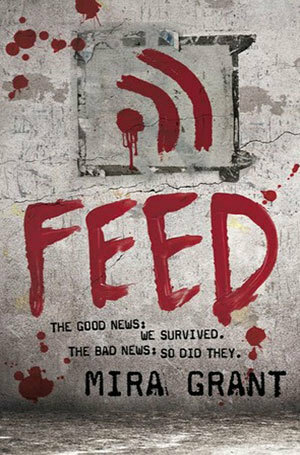 Feed, by Mira Grant, is an exciting thriller set in a future with zombies. The Audible edition will really pull you in! This “Making of” book about “The Phantom of the Opera” is a tremendous resource and clearly a work of love by author Philip J. Riley. The term ‘classic’ is much over-used today, which possibly takes away from the importance of the meaning. To say that the 1925 film, The Phantom of the Opera, is a classic is an understatement, even its truest meaning. It is, quite possibly, the classic film defining the early form of the film medium and the wizardry initiative that film began. In this book, Riley has dug deep to unearth some great information and interviews with those who have a connection to the film. What is unknown to most people is that there is almost as much a mystery surrounding the original film as there is in the story. What most people think of as the original 1925 silent film, starring Lon Chaney, is actually a modified, re-edited version. Riley takes us through all the variations of the film, what is known about the different versions, and what is unknown. I found it fascinating that in this silent film era, some (though not all) of this film was filmed in Technicolor alongside the standard black and white. This information and research alone is valuable to anyone interested in the film and the changing era of silent to talkies and black and white to Technicolor. But this book offers so much more. I’ve been a fan of films and film-making and done a fair amount of research of screenwriting but I’ve never had the opportunity to read a script as it was written for the silent film era. 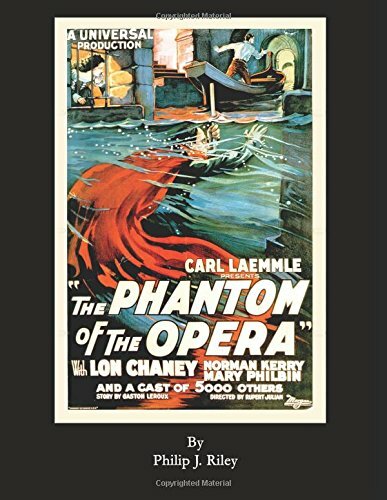 I personally may have been most excited to read through the original silent film script for Phantom of the Opera than any other aspect of this book. There are a lot of stills included here, as well as press releases and reviews and articles by other magazines. The book ends with a very long article (or series of articles) from Liberty magazine, detailing Chaney’s career. Much of this extra, included material is in the form of reproduction straight from the original source (in the case of newspaper or magazine articles often including period ads). While it is so nice to see these things exactly as they appeared originally, it was sometimes very hard to read these, especially in the digital format that I was using. I truly can’t believe how much valuable information was included in this volume and I think that this should be a required textbook for anyone interested in film. Looking for a good book? Philip J. Riley’s The Phantom of the Opera is a well-researched examination of one of the most critical films in Hollywood’s history. Certainly, the fact that I can’t separate what’s fiction and what’s true says that there is a strong sense of ‘real’ in the writing. FOr that, I am impressed. But each of these stories is a bit depressing. The most positive one I can think of, off-hand is “Marilyn” which perhaps has a positive slant for the narrator, but which over-all is still a downer. And fiction that is depressing is okay … but why read it? Is there something to be gleaned from it? The quote on the book’s cover, as seen above, is from the Pittsburgh Press and compares Feder with Woody Allen, Philip Roth, and even Mark Twain. I would agree with the comparison to Roth, specifically the blurring of the lines between fact and fiction. But Woody Allen? No. Mark Twain? Definitely not. I’m really not sure how these characters are universal. I don’t think I know any of these people … which is good. The stories are okay. They feel real. But these aren’t people I want to spend much time getting to know. Looking for a good book? 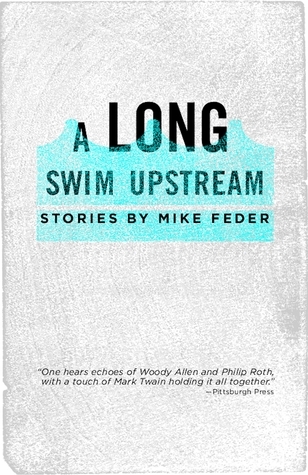 A Long Swim Upstream almost seems a metaphor for what it’s like reading these stories by Mike Feder. Over the course of the last two years I’ve read and reviewed over 200 books. I would say that most of them have been better than average and I’ve read some that have really interested me in some new authors and/or series’. But one of my absolute favorites is the ‘Jake & Laura Mystery’ series by Michael Murphy. I will drop everything to read a Jake & Laura story. But every series has its ups and downs. The mark of a true fan is one who sticks with a series through the bumps and still finds the positive points in the book. That’s how I see this book. Jake Donovan’s “Blackie Doyle” book series sales are slipping. Jake’s editor dismisses the latest manuscript and tells him he needs to start over but he really needs to focus and get back to what made Blackie Doyle so popular in the first place. So Jake and his famous-actress-wife Laura get on a train and head for a small Pennsylvania town where Jake once worked as a Pinkerton man. The town still has a murder case that’s gone unsolved for a decade. A murder case that Jake once worked on. And on the anniversary of the murder of the teen-aged girl, there are some who hope Jake can finally solve the crime, but too many who seem to be doing everything they can to stop the investigation. But what Jake really wants to do is write his next best-seller. This fourth book in the Jake & Laura Mystery series takes on much more of a classic ‘who-dunnit’ mystery, which is just a little bit of a departure for the series. Heading to a small town to solve a ten-year old murder … no famous actors or musicians or politicians or socialites … with some folks who almost come out of Mayberry is a departure, not just for the reader, but for Jake and Laura, too. This reads like a cozy mystery. Although there is a murder, it happened ten years ago, and the leading suspects back then are still around and Jake still hasn’t ruled them out – even though one of them, a reverend, is the one asking Jake to solve the case. Nothing too terrible happens here … some threats, some bullying, but the biggest danger is whether or not Jake’s new manuscript will become a bestseller. While I can’t really help but compare it to the other books in the series, even if we look at it as a stand-alone novel, there are a few small issues I have with this volume. First, it was pretty clear to me who the culprit was going to be. I am not the most educated mystery reader (I’ve often been surprised by mystery resolutions where others report on how evident it was early on). But mostly, I was a little tired of reading, over and over, Jake telling people he was not there to solve the mystery, but to write his book. It felt as though every character he met he had to tell them the same thing. It is one of the memories I take away with me after reading the book, which is not the way we want to leave a book. The irony is not lost on me that a book about a writer who needs to ‘return to his roots’ or to put his character back into the sorts of situations that he’s most famous for, is precisely the same situation that I feel Michael Murphy is in here. Part of the great appeal of the Jake and Laura books has been the famous historical figures with whom they’ve rubbed elbows. Whether it’s giving song advice to a famous song writer, or aviation advice to a famous aviator, Jake and Laura really shine when they complement great historical figures and have a mystery to solve. Also, we left Jake and Laura at the end of the last book on the verge of something big, something like a world war, and the potential for some really dramatic mysteries. This book feels like an interlude – like something that could have been written at any time to have on hand. Still, I consider myself a fan of Jake and Laura and I’ll read any of their mysteries. This current installment may not be in keeping with what has already been established, but it’s still a good story with good characters. It’s just a little leaner than the others to date. Looking for a good book? 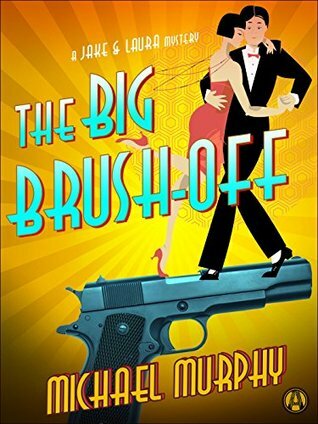 The Big Brush-Off by Michael Murphy is the latest in the Jake and Laura Mystery series, which departs from the usual high drama and famous figures stories of the previous books If you don’t mind a cozy mystery with a tough writer/detective and his famous actress wife, then this is the right book for you. Ever since I saw the movie The Great Waldo Pepper, I’ve been fascinated by the idea of barnstorming and the transient, circus-like life those people led, and so I was very interested in reading Susan Crandall’s The Flying Circus. WWI pilot Charles “Gil” Gilchrist is flying around the country, barnstorming (selling airplane rides and performing stunts). The war affected him and he’s carrying some emotional baggage. Gil meets Henry Jefferson who has a knack for fixing an airplane’s engines and also manages a good spoken patter to get people interested in paying for a ride. Henry talks his way into travelling with Gil and seems to be carrying his own secret, on the run from something. Together, they meet up with Cora Rose Haviland, a young woman who seems to know no fear and is willing to perform daring stunts on Gil’s plane. The three travel across the country, performing and offering rides and even competing with other barnstormers. But each holds a secret that could break apart the trio. I very much liked the characters and the interactions between them. It all felt very real and natural. And the progression of their travels and the build-up of flying and competition was very nice. But what I found frustrating was that the story kept playing with something bigger than the individuals. The baggage that each carries should be bigger than the individuals, and it’s often hinted at and we’re teased with it, but it keeps taking a back seat to the main story until we get almost to the end and then it doesn’t feel like an integral part of the story but instead tacked on because we were teased with it. In many ways, it seemed that the first three-quarters of the book was character study and set up for a plot that doesn’t really start until the book is ready to finish. This wasn’t a bad read, but it didn’t make me eager to read any more by Ms. Crandall. Looking for a good book? 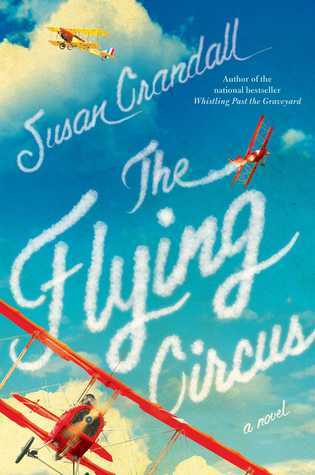 The Flying Circus by Susan Crandall has some very nice characters in a setting that has a lot of potential, but the meat of the story doesn’t happen until near the very end. Clearly I’m letting a bit of my geekiness show through in that I am review a fair amount of Star Trek related books and graphic novels. I have to admit I enjoy the nostalgia of entering this world that I enjoyed so much back in the 1970’s. I was not much of a fan of this first story, “The Tholian Web.” It is both the same story we know from 1968 and yet a very different story. It manages to capture the uncertainty surrounding this first encounter with an unknown alien race and the danger and fear of an unknown (spatial interphase) which is a part of the original story, but it completely fails to tell a story about humanity – the struggle to deal with the loss of a commander and friend while suffering from crippling psychosis is just as much a part of this story. In addition to a story that is lacking is some artwork that is generally pretty poor. The characters are mostly recognizable but figures are often out of proportion and cartoony. “Deity” was, in many ways, a much more interesting story. Sulu given his first field command had a nice subplot, but the story of investigating a ‘new’ race, the use of a new technology that fails and the conundrum of what to do when contact is errantly made. The story proves to be interesting but in an odd way both rushes through the plot and pads the story unnecessarily. The problem is focus. Perhaps too much is being attempted in a short story and while it can offer up a number of different small stories it doesn’t really have time to develop any of them well. The artwork here is very nice … some of the best I’ve seen in Star Trek graphic novel. It’s a little bit sad that this art talent is ‘wasted’ drawing giant chickens and roosters. Yes … the alien race being observed here is a race of giant chickens. “Flesh and Stone” was perhaps my favorite piece here and I’ll admit that this is likely because it features the Kirk, Spock, McCoy of the original series and not the characters as portrayed by Pine, Quinto, and Urban. And while it’s only a panel or two, part of the bridge crew includes Lt. Arex, a character I always wished to see more of. This story features all the doctors from the series franchise. Pulaski, Phlox, EMH, Crusher, and Bashir meet for a medical conference. Aboard the ship carrying a crew of medical personnel, something strange has afflicted people, slowly turning them to stone. Because Crusher, Bashir, and Pulaski were late getting to the meeting, and EMH is a hologram, they are not infected with whatever is happening. Searching the database, EMH sees evidence of something similar happening a very long time ago, but the records have been erased. It’s up to Bashir, Crusher, and Pulaski to track down the aged Doctor McCoy to see if he remembers the incident that has been erased and if he can help them recreate a cure. McCoy recalls an incident that involved Tholians and a virus that they planted, but with the help of lecturer and doctor Phlox from the academy, they were able to create a cure. Fortunately, the old Admiral McCoy still has the records on one of his tricorders, which he hands over. Not a deep, involved story, but not just a shoot-’em up action piece either. It was just what you might expect from a twenty page story. And the artwork, while not as strong as the preceding story, was very good. This issue of the graphic novel has a real variety of quality, just in three short pieces, and that’s sort of indicative of the series on a whole. Sometimes you’ll be pleasantly surprised and sometimes you’ll wonder how a story ever got into print. But because I’m a fan of the series, I’ll keep reading these books as well (and we know that’s what the publisher is counting on). Looking for a good book? Star Trek, Volume 11 is a graphic novel with some really poor art and weak stories but also with some very nice and interesting fiction and some really strong art. If you are a fan of the series, you’ll probably enjoy this.